Linda Sue claims to be an animal advocate who focuses on rabbits. But, she has associated with Joe Schreibvogel, one of the most notorious exploiters of tiger cubs in the country, and joined in his false attacks on Big Cat Rescue. This is in spite of the fact that Schreibvogel, in our opinion, is a hypocrite who has duped her and other rabbit advocates into thinking he was concerned about rabbits. According to an email from a former staff member who worked at Schreibvogel’s zoo, Schreibvogel regularly fed live chickens and rabbits to his big cats until he decided to attack Big Cat Rescue with false claims and encourage rabbit advocates like Linda Sue to join in his attacks . See email correspondence below between Howard Baskin of Big Cat Rescue and Satrina McAnally, former bookkeeper at Schreibvogel’s G.W. Exotic Memorial Animal Park. 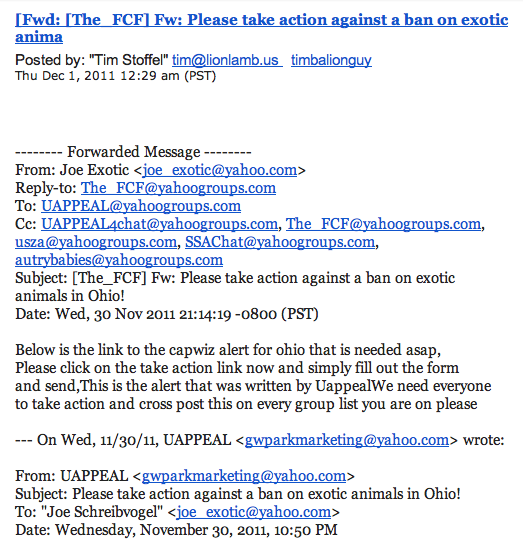 Rather than go to trial, Schreibvogel in early 2013 agreed to Consent Judgments totaling over $1 million after being sued by Big Cat Rescue in federal court for trademark violations and violating the Digital Media Copyright Act (DMCA) by using and misrepresenting a photo owned by Big Cat Rescue of rabbits that are purchased frozen as food for the cats. After take down notices were issued by Big Cat Rescue pursuant to the DMCA, Schreibvogel falsely, under penalty of perjury, issued a counter notification. For more information about Schreibvogel, with whom Linda Sue has appeared on internet broadcasts, visit www.TigerCubAbuse.com. 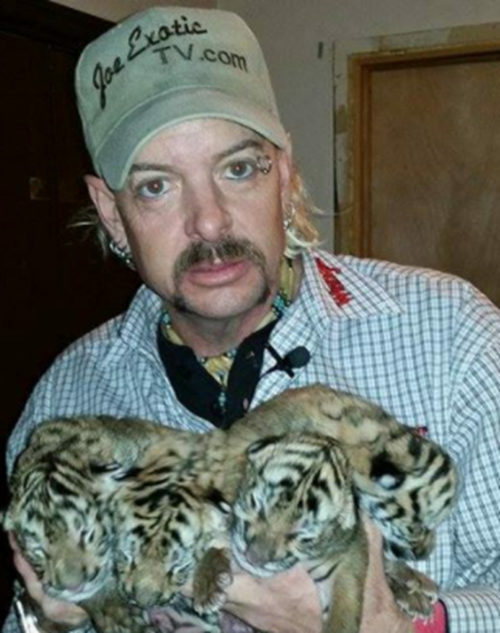 On April 2, 2019 Joe “Exotic” Schreibvogel Maldonado Passage was found guilty by a federal jury on 17 counts of illegal wildlife trafficking, killing tigers and two counts of murder for hire, soliciting the murder of Big Cat Rescue founder Carole Baskin. We believe it was in retribution that Linda Sue Malie started this Change.org campaign asking people to contact Governor Ron DeSantis and FWC Inspector General Mike Troelstrup demanding that Sky and her four newborn kittens be euthanized or dumped into strange territory, where the kitten’s deaths would be imminent if the mother could not find a proper den site and establish new territory in time to save them. Could you remind me where you said he bought chickens and rabbits that were put in the cages alive? We got them from a swap meet or we had a couple guys that would deliver them if we called. We even let a couple customers throw them in and some got to watch. When the public was around it was only chickens. After hours they would give them rabbits.